A Raw Vegetable Diet: Right for You? Although an exclusively raw vegetable diet may be too extreme for some, a lot of us could likely benefit from more fruits and veggies in our diets. Plus, they're not just for rabbits anymore, either. 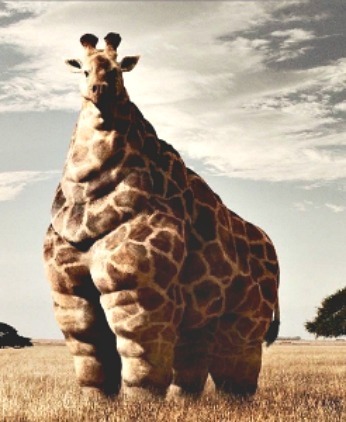 Still, I won’t try to tell you (or the giraffe) that a raw vegetable diet will cure All your ills or take fifty pounds off you in a month or two. And most assuredly not if you're chomping cheeseburgers and eating doughnuts at the same time. (I'm talking to you, dedicated carnivores and/or pastry lovers.) But fruits and veggies (raw or otherwise) may go a long way toward easing at least some of your ills and also taking off some of those extra pounds. Why? Because veggies bring great stuff to the party: vitamins, minerals, enzymes, fiber, antioxidants, and phyto-chemicals all wrapped up for you in packages of every color. Not only are they beautiful, but they're also really good for you. Ah, but you’re just not that crazy about certain veggies, you say? Well, neither am I, and I’m a vegetarian (yeah, go figure). But you know what? Veggies sometimes taste a Lot better to some of us raw than cooked: as good a reason as any to buddy up now and then with a raw vegetable diet. So maybe give those veggies you think you don’t like another shot. Perhaps you'll discover that you’re actually crazy about some of them...with or without a dip. For example, Brussels sprouts taste quite good raw, especially thinly sliced into a salad or sandwich—nice and peppery. Uncooked or even merely "under-cooked," certain vegetables take on an entirely different character. Place some thinly sliced fennel and sliced/blanched green beans or raw snap peas in a bowl with some cooked fettuccine (broken up before cooking). Add in some chunks of segmented orange or red grapefruit and a handful of chopped walnuts or sliced almonds, plus a few onion slices if you simply must. Then toss with a pinch or two of dried herbs and a modest amount of your favorite dressing, and you'll have the type kind of salad that can stand up to dressing (IMHO.) It's also a quick and easy way to get a few more veggies into your diet. The great thing about this kind of diet is that you can work toward it in stages, instead of racing out to buy another refrigerator for all the veggies you start buying by the bushel. Also, by advancing one step at a time, you’re likely to generate less resistance from yourself and your “old ways.” So, the changes you’re making in your eating habits are more likely to become permanent. With raw veggies, a gradual approach is good from a physical standpoint, as well. Since vegetables have a lot of fiber, overdoing things at the start could stir up some serious discomfort. After all, who wants to walk around puffed up like a balloon, right? But if you take all this a step at a time, adding another veggie every few days, you’ll eventually get your diet to a good place for you. And your body and taste buds will thank you. One day, maybe you'll even start growing a few of your own F&V...and there's a happy thought!